When guests publish their reviews or surveys online, they are visible to millions of travelers on hundreds of global booking sites, impacting future booking decisions. 95% of guests read feedback prior to making a booking decision, and after price, reviews are the most important decision variable when booking a hotel. Integrate your TrustScore and review widgets onto your own hotel website or Facebook page to provide travelers the information they need to make a booking decision. Add reviews on your hotel website to influence rich snippets on Google. Build trust and increase click-through conversion from organic search results by providing relevant review content. Positively influence millions of travelers to book your hotel by showcasing your own positive reviews on hundreds of travel sites worldwide, including Google, KAYAK, and Hotels.com. 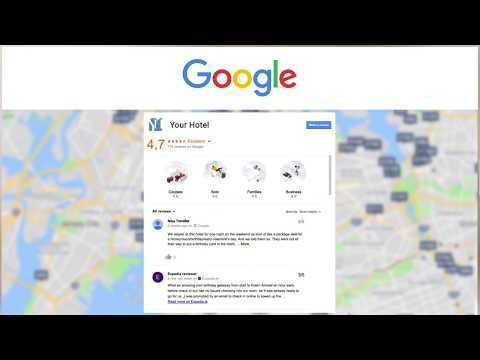 Display your own hotel survey reviews on Google next to major travel sites like Expedia and Priceline.com. Get a direct link back to your website and drive traffic away from your competitors. Want to go behind the scenes and see how TrustYou (Review Marketing) works? Unfortunately the mention section does not work properly as it seems to be weak. The guest mentions something positive but it shows on the report as the guest mention negative. For example, "The restaurant was full and they prepared a nice table with a good set up'' sentence is positive but the first sentence is "restaurant is full" so It became as negative on TrustYou in the sentiments. Normally the guest tried to mention that the staff is helpful! Unfortunately as a guest relations manager, I am not able to get a healthy report from TrustYou. Review Management and overview about reviews! Guest Feedback helps also! I mostly like TrustYou's customer service, they are all very helpful and kind. If we need any assistance all of the guys immediately take an action. The fact that all is centralized through one platform. All my GMs can access with their own user access. Easy staff to deal with. Easy portal to navigate through. Accurate reporting. Amazing ORM platform! Our hoteliers clients love the user friendly interface and the fact that can manage all their online reputation from one single system! ("one stop shop"). Highly recommended. The handling is very simple, which we like very much. It's good to have a platform where all messages are pulled together. Otherwise it would be difficult if you had to answer all the evaluations on the individual booking portals. Many thanks for that! Quick overview over all platforms. Very user friendly and also easy on the eye. Want to find a reference in your network who uses TrustYou ?